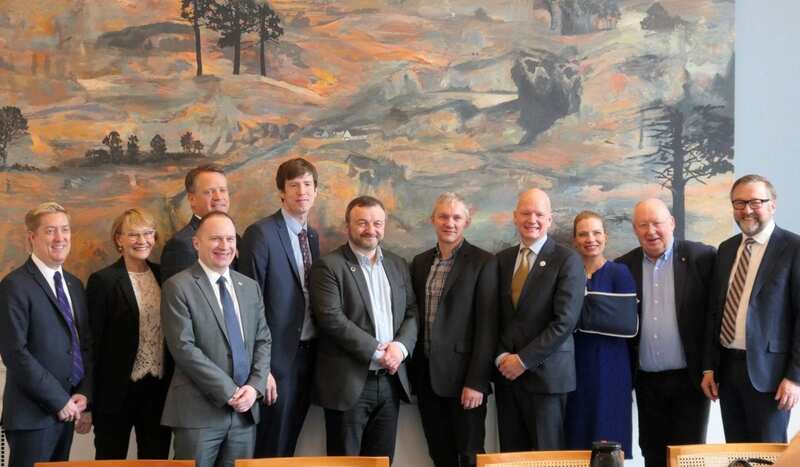 As the AEC is preparing for the transition of its chairmanship from the Finnish business community to the Icelandic Arctic businesses, the organization’s Governance Committee met in Copenhagen, Denmark at the end of March. This was the first time a formal AEC meeting was held in Denmark. Hosted by Danish Shipping and Dansk Industri (DI), the AEC Governance Committee had a comprehensive program. In addition to preparing for the transition of AEC chairmanship in May in an internal meeting, the AEC delegates also had the opportunity to acquaint with the different Arctic stakeholders of the Kingdom of Denmark. At a meeting with the Faroese representatives of the Danish Parliament, Mr. Sjúrđur Skaale and Mr. Magni Arge provided the group with a briefing on the state of Faroese economy and its Arctic ambitions as well as of the recent infrastructure development. This was followed by a meeting graciously hosted by the Danish Ministry of Foreign Affairs. In addition to a briefing on the Kingdom of Denmark’s Arctic strategy and priorities, the AEC representatives also had the pleasure of meeting the Head of Greenland representation in Copenhagen, Ms. Lida Skifte Lennert, and Adviser of Innovation Oyvindur av Skarđi of the Ministry of Foreign Affairs and Trade of the Faroe Islands. In 2018, the AEC served as an expert partner in an analysis on Business Finance in the Arctic commissioned by the Ministry of Foreign Affairs of Denmark. The analysis was internationally launched in January 2019. While in Copenhagen, the AEC discussed the recommendations of the analysis as well as the follow up work with both the Ministry of Foreign Affairs and the consultants who conducted the work. To gain a comprehensive overview of the Kingdom of Denmark’s Arctic capabilities, the AEC Governance Committee had a round table discussion with representatives of academia representing different fields of Arctic science. Another topic for roundtable discussion was maritime transportation in the Arctic. With a Working Group dedicated to Maritime Transportation, this topic is also high on the AEC’s agenda.